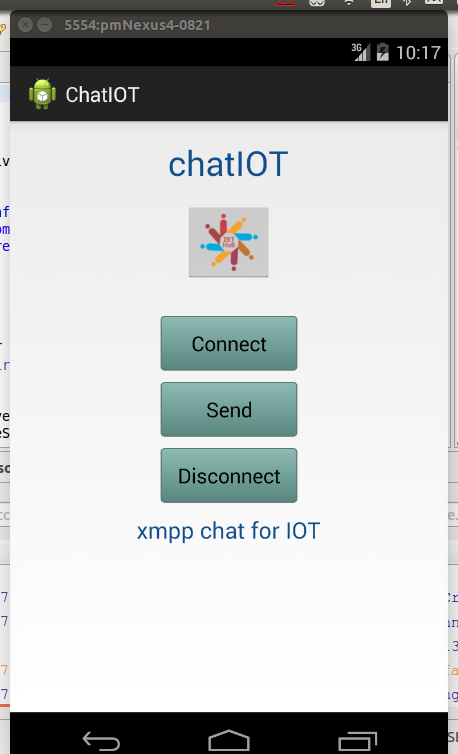 In an earlier blog post we had explained how a public XMPP chat server can be used to transmit messages between two computers. In that post we had shown how we can build a chatbot listener in Python that waits for messages and when messages arrive, there was a some simple logic that allowed it to either ring an alarm ( sound a bell tone) or insert the data into an SQLite database. This chatbot -- ChatIOT -- was tested by sending messages from a Xabber, a free XMPP chat client using two userids registered on a free, public XMPP server available at adastra.re. 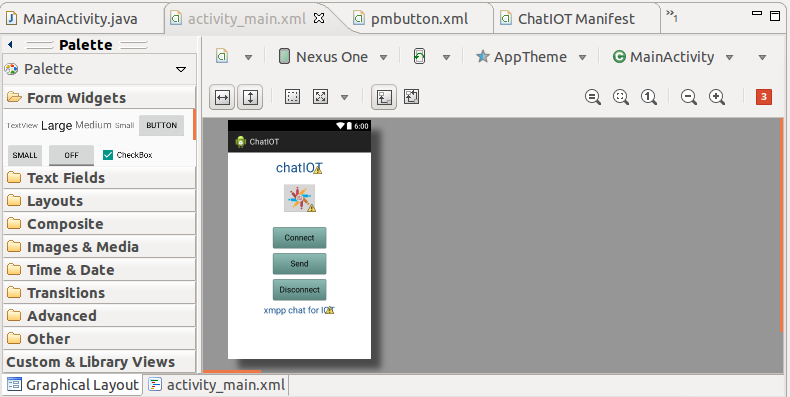 This post shows how to build a basic XMPP client for Android, from scratch, using Java and the Smack XMPP library from the Openfire opensource project. Non-trivial Android app development is not for the faint hearted. 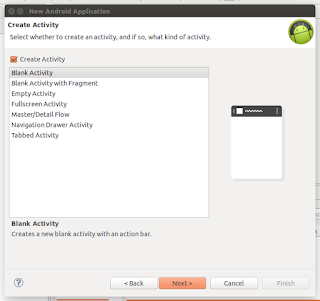 If one has never developed an Android application in the past, it would be good idea to look through this post Building an Android App -- Getting Started. Click through the rest of screens until the project is created and is visible on the Package Explorer panel on the left of the Eclipse Screen. This will show many errors because many of the required resources, artifacts are still missing. Thread.sleep(5000);                 //1000 milliseconds is one second. 2. Download a python script getMavenArtifactsNG.py This is in Python 3. Hopefully you have that! 4. Execute the command ./getMavenArtifactsNG.py -f artifacts.csv -p <path_to_Eclipse_Workspace_Directory>/ChatIOT which is the project directory. This will populate the libs and libs-sources directory with a zooful of jar files! 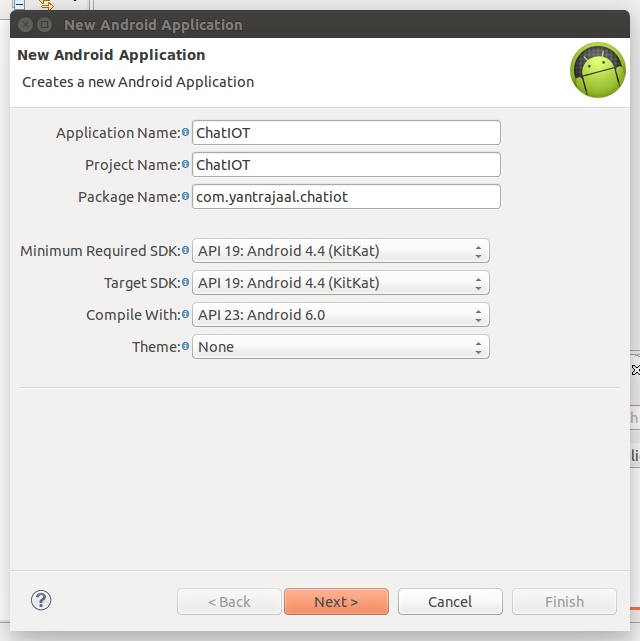 Refresh the project and this will remove all errors EXCEPT on the lines that refer to the ChatManager. For some reason, the script given above does not load the smack-IM libraries! 5. Go to the downloads section of the Smack library and download the smack-4.1.4.zip file. Unzip this file, locate ONE file smack-im-4.1.4.jar and copy it into ChatIOT/libs directory. This should remove all compile time errors. This test assumes that we have two registered userid at the xmpp server adastra.re. So create two IDs say uid2 and uid3. 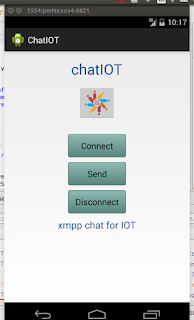 In principle you can choose any public XMPP server but this program has been tested at AdAstra. Set up the ChatIOT listener chatbot by following these instructions and and start the chatbot using the uid3 userid and its corresponding password. The Send button can be pressed repeatedly. The Disconnect button will cause a logout. Finally for uid2 to be able to send a message to uid3, the two users must be in each others contact lists! Please use a standard IM client like Pidgin or Xabber to first establish this contact. Otherwise no message will ever be relayed. You may be wondering why we have used uid2, uid3 as users. Actually there is another user uid1 through which we can keep a check on when uid2 and uid3 are logged in and able to communicate. Java programming on Eclipse is a treacherous business because more often than not the libraries cannot be located and loaded. 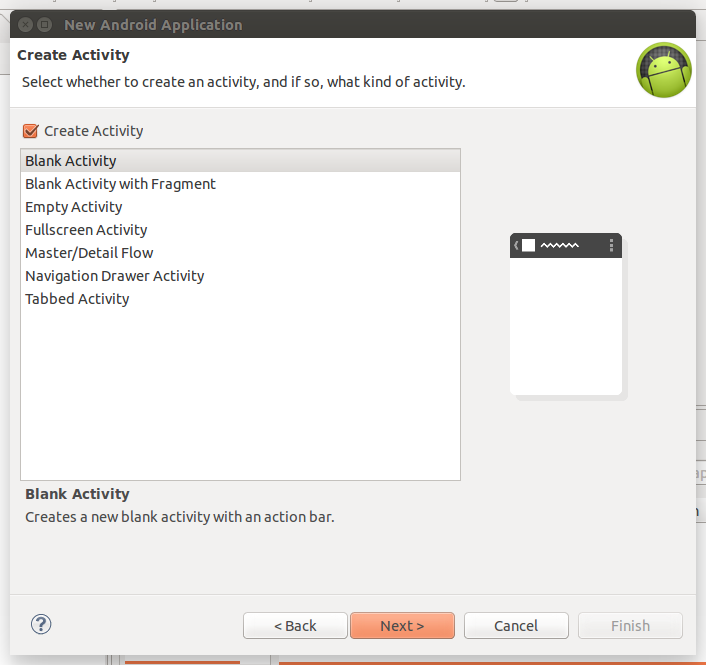 With Android and Smack there is another level of complexity. Hopefully the steps given here will work. If there is a problem, you can always download the entire project from GitHub, with all libraries in place, and import the same into Eclipse. Hi, Great.. Tutorial is just awesome..It is really helpful for a newbie like me.. I am a regular follower of your blog.